As a farmer, James Fairlie is accustomed to risk, uncertainty and change. However, James, who runs the operations at the Kirkton of Monikie Farm in Angus, along with his father, Iain, has cemented his future by embarking on a new business project which complements his day-to-day farm work. 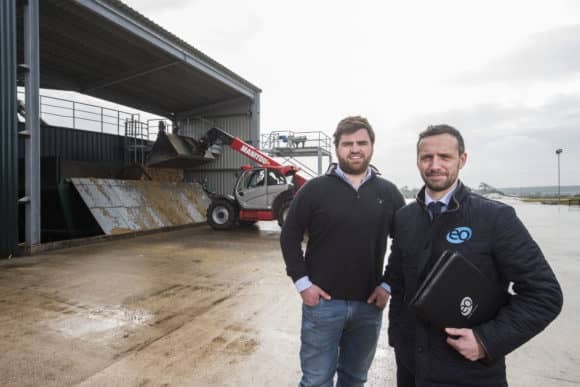 James (29), who won ‘Young Farmer of the Year’ in the Farmers Weekly Awards 2017, believes rewarding times are ahead after investing in an Anaerobic Digestion (AD) plant on the farm at Monikie. The AD plant runs at a constant temperature of 41 degrees which induces an anaerobic state that James compares to a ‘large cow’s stomach’ which, in turn, generates 500kW of electricity that James then sells to the national grid. The plant also provides a lucrative outlet for by-product waste which can be used as fertiliser on the farm. Steering him in the right direction throughout was EQ Chartered Accountants who, with offices in Dundee, Forfar, Cupar and Glenrothes, are widely regarded as Scotland’s leading agricultural accountants and business advisors. A key member of the team is EQ Partner and Agricultural Corporate Finance specialist Mark Smeaton who assists many farming businesses with new ventures, including land acquisitions and renewable projects as well as the reorganisation of existing bank debt. In just two years, Mark has succeeded in finance deals worth around £140M for his agricultural clients. Researching the idea, Mark helped James go over the projections, calculate the potential income and explore how to use that income to invest back into the farm.